Overall, the incidence of chronic HBV infection was noted at ≥10% in the obstetric population in Asian countries and immigrants from these countries.2 Data from Hong Kong showed that HBsAg carriage was 6.6% in 19763 and 10.1% from 1998 to 2008.1 Among the first-year university students, the incidence was found to increase from 0.9% to 5.5% with age at ≤18 to ≥21 years.4 Among the young mothers, the incidence similarly increased from 2.3% to 8.4% with age at ≤16–25 years.5 Therefore, maternal HBV infection could still be encountered in the future. However, there is no information on the incidence of chronic HBV infection in the general population, and government data is invariably derived from selected groups such as blood donors which cannot be extrapolated. Acute HBV infection is uncommon in pregnancy. Most pregnant women who were identified with HBV infection by antenatal screening were chronic asymptomatic carriers, particularly in Hong Kong.1,5 Nevertheless, pregnant women can still develop complications related to HBV infection in addition to vertical transmission to their offspring. Routine antenatal screening is recommended, irrespective of the history of immunisation. Although further tests and serial monitoring on liver function and viral activity were often not undertaken, additional testing for hepatitis B envelope antigen (HBeAg) and HBV deoxyribonucleic acid (DNA), as well as serial monitoring of alanine transaminase (ALT) or panel of liver function test (LFT) were performed worldwide. As the test results could provide useful information on viral activity, risk of vertical transmission, and help to distinguish ongoing hepatitis from obstetric complications such as pre-eclampsia and haemolysis, elevated liver enzymes, and low platelet count (HELLP) syndrome, this practice is recommended. 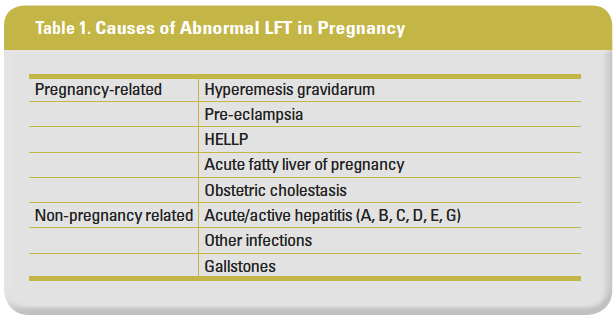 Feasible assessment of ALT/LFT should be performed once every trimester to provide the baseline for comparison and differential diagnosis when obstetric complications occur. 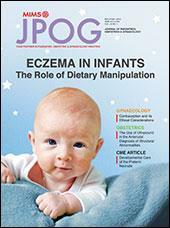 It is usually held that maternal immunologic alteration during pregnancy enhances viral activity. A study on HBsAg-positive gravidae in Hong Kong found that circulating HBV DNA was detected in 48% at <16 weeks, 59% at 34–36 weeks, and 61% at 6 weeks postpartum, while 5% had an elevated ALT level greater than the laboratory reference range during pregnancy.6 Although rare, antenatal flares may occur and masquerade as obstetric complications, which could result in lethal consequences to mothers after delivery.7 Hence, in an endemic area, disturbance in liver function during pregnancy should not be dismissed as an obstetric complication which would resolve postpartum (Table 1). Information about viral activity and serial monitoring of ALT/LFT would enhance clinical management when needed. 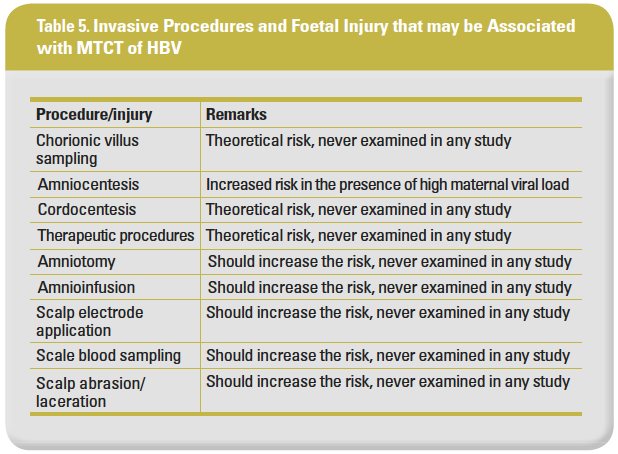 The effect of HBV infection on obstetric outcome has been controversial (Table 2). Many studies have reported increased obstetric and perinatal complications, including pregnancy hypertensive disorders (PHD), gestational diabetes mellitus (GDM), preterm birth/labour, prelabour rupture of membranes (PROM), preterm premature rupture of membranes (PPROM), antepartum haemorrhage/abruption, caesarean delivery (CD), neonatal intraventricular haemorrhage, foetal loss, perinatal mortality, congenital malformation, low birthweight, foetal distress, and admission to neonatal intensive care unit, 8-15 although no increased adverse outcome was reported.16 Intriguingly, previous studies have also found a reduction in PHD.9,17 While most studies reported increased adverse foetal/perinatal outcomes, increased incidence of large-for-dates and macrosomic infants independent of the effect of GDM10,18 were also found. The reasons for these contradictory observations were unclear, but the possible explanations include different HBV genotypes in different study populations, inclusion and proportion of acute or active hepatitis vs chronic asymptomatic carriers, ethnic differences for some of these complications, and presence of confounding factors that were not considered. Nevertheless, it would be prudent to manage gravidae with HBV infection as high risk and monitor maternal and foetal wellbeing. 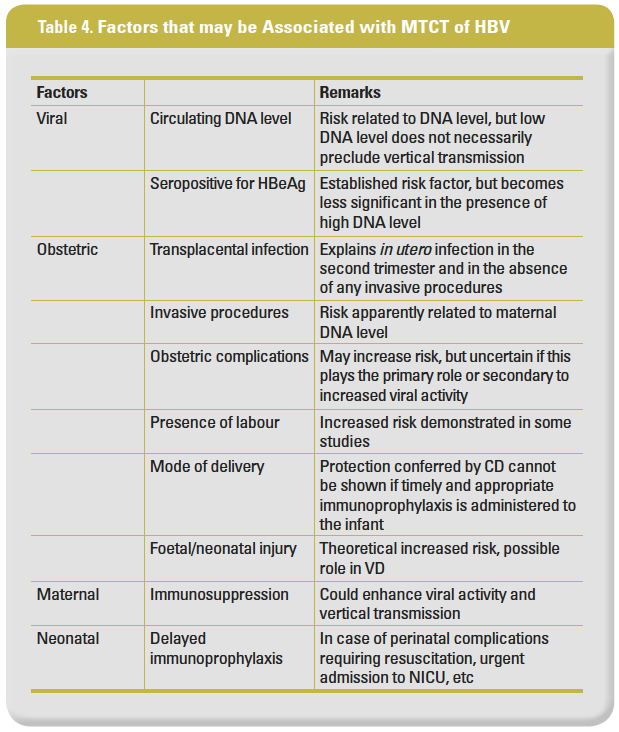 The use of maternal antenatal antiviral treatment is restricted to the treatment of active hepatitis during pregnancy, as the medications (class B and C, Table 3) have potential foetal effects. Antiviral treatment should be commenced when indicated, following consultation with a hepatologist. Ideally, all HBV carriers should be placed under joint management with a hepatologist, but this may not be feasible logistically in endemic areas due to the considerable number of HBV carriers delivered every year, completely unpredictable timing of antenatal booking and visits, and the need for these patients to be seen urgently prior to delivery. It would be pragmatic for obstetricians or maternal-foetal medicine specialists to initially screen the mothers and then arrange for the selected mothers to attend a special clinic, where the patient will be seen jointly by the maternal-foetal medicine specialist and the hepatologist for a consensus opinion. The use of antiviral medications during pregnancy to prevent mother-to-child transmission (MTCT) will be discussed later. Indeed, in the latest report on maternal treatment to prevent MTCT, increased ALT level was more often found in the treatment group at any time during the trial, including the postpartum period.22 It remains to be seen whether antiviral treatment commenced in the last trimester of pregnancy and stopped abruptly after delivery would increase the risk of postpartum flares. 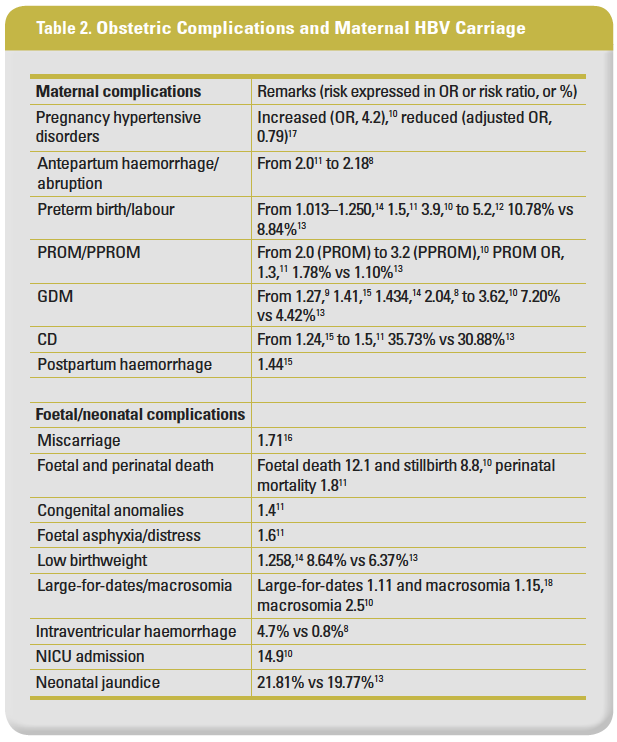 Although generally mild with spontaneous resolution, postpartum flares may persist beyond 12 months postpartum.19-20 These mothers should therefore receive longer term follow-up. Whether flares could reflect underlying liver pathology or affect long-term maternal health is unknown. For most clinicians, the major issue and gravest concern of management in pregnancy is the avoidance of MTCT. However, the timing of MTCT (whether during pregnancy, labour, vaginal delivery [VD], or breastfeeding) and whether it is a continuous or episodic process remains largely unknown. Most studies only examined the offspring once or twice at birth, shortly after birth, and/or several months after birth. 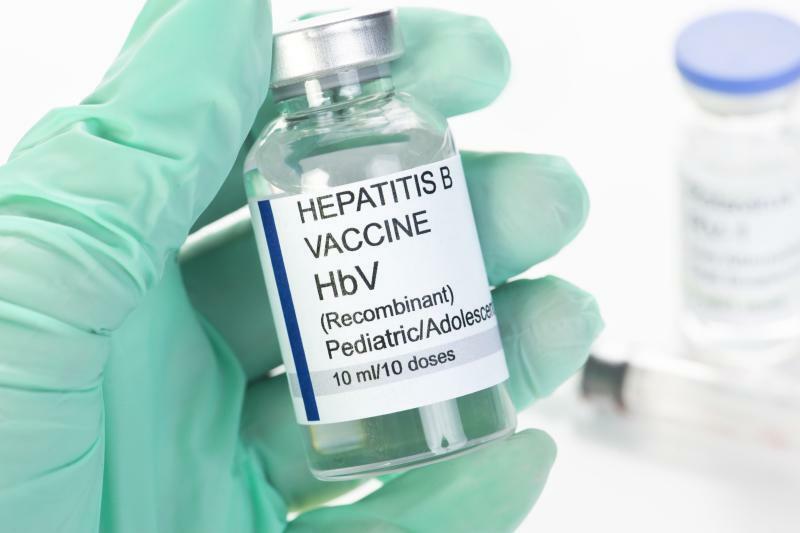 Furthermore, HBsAg and HBV DNA positivity in cord or neonatal blood could represent a transient phenomenon.23 Hence, a diagnosis of HBV infection in the asymptomatic offspring should only be made after completion of the last dose of the course of hepatitis B vaccination. However, investigation at this stage may not allow the source of infection to be determined, which includes not only the mother but also other infected members of the household such as the father, grandparents, caretaker, and siblings. Maternal transmission can also occur a few months after delivery if the offspring fails to develop an immune response to vaccination and after the protection induced by hepatitis B immunoglobulin (HBIG) given at birth wanes. These factors are summarised in Table 4. In a study on 109 HBsAg-seropositive mothers and their offspring before immunisation,23 maternal viraemia was noted at 73.4%, with 87.5% in HBeAg-seropositive mothers and 72.3% in HBeAg-seronegative mothers, while 92.7% of the mothers who were HBeAg seronegative had lower serum DNA levels (median level 8.75 vs 3.59 log10 copies/mL). For the offspring, neonatal viraemia in cord blood was noted at 24.8% overall with a median level at 2.18 log10 copies/mL, and 37.5% (3/8) and 23.8% (24/101) of the newborns of HBeAg-seropositive and seronegative mothers, respectively. Newborns of HBeAg-seropositive mothers had significantly higher HBV DNA levels (3.24 vs 2.18 log10 copies/mL). However, when analysed according to maternal viraemia, neonatal viraemia was detected in 19/80 (23.8%) and 8/29 (27.6%) of the mothers with and without undetectable DNA, respectively. Finally, there was no difference in maternal perinatal mean DNA levels between mothers of viraemic vs nonviraemic newborns (2.61 vs 2.17 log10 copies/mL). The data from this study indicated that both maternal HBeAg status and circulating HBV DNA levels cannot reliably predict or rule out in utero foetal infection. However, a recent study reported that amniocentesis in gravidae with a high viral load was associated with increased risk of foetal infection.30 It is therefore important to assess maternal viral load prior to amniocentesis or other invasive procedures. If maternal HBV DNA level is high, the situation should be carefully explained to the parents, including the limited information on the risk and long-term implications of in utero HBV infection, and other options such as noninvasive means of diagnosis should be offered. There is no literature on the role of either prophylactic HBIG or antiviral medications given before the invasive procedure to prevent MTCT. Labour always precedes VD, while the majority of CD are elective without preceding labour. Therefore, in the interpretation of the literature on the impact of mode of delivery on MTCT, the comparison involves not only the route of delivery but also the presence or absence of labour in many instances. The study of Papaevangelou, et al,23 showed no significant difference in neonatal viraemia, which was found in 26.5% (18/68) of the newborns following VD and 21.9% (9/41) of the newborns following CD. Although CD appears to be associated with a reduced risk of MTCT, a recent meta-analysis indicated that convincing benefit could not be demonstrated due to significant study heterogeneity from variable HBIG administration, which highlighted the importance of HBIG in the prevention of MTCT.33 In view of the implications of previous CD on subsequent reproductive outcome and the effectiveness of HBIG, the role of elective CD for the sole purpose of preventing peripartum MTCT is questionable. It would be prudent to reserve CD for obstetrical indications until there is sufficient evidence of its protection against MTCT. As these medications were essentially given in the latter half of pregnancy to mothers with high viral load, mostly during the third trimester or after 32 weeks of gestation, the treatment would not cover invasive procedures in the first two trimesters such as amniocentesis, and the duration of treatment might be insufficient for infants born preterm following spontaneous preterm labour or iatrogenic preterm birth, especially in mothers with lower viral activity or HBeAg seronegative status in whom the risk of MTCT is still present. Furthermore, although all reports claimed a lack of foetal teratogenic risk, it should be noted that the medications were prescribed in the last trimester and not earlier at the period of organogenesis. To provide cover for antenatal diagnostic procedures in early pregnancy, and for gravidae identified at high risk of preterm and extreme preterm delivery (either through previous obstetric history or transvaginal ultrasonography), these medications may have to be prescribed much earlier in pregnancy when foetal safety could be a concern. A press release from the Department of Health (DH) in Hong Kong in 2011 stated that the DH conducted a special study on more than 1,900 children born in 2009 and found that HBsAg seroprevalence was only 0.78%.38 As maternal antiviral treatment was not provided at that time, the findings showed a clear evidence of the effectiveness of combined passive-active hepatitis B immunisation programme that was implemented since 1988. Overall, the cost effectiveness and risk-benefit ratio of the third trimester maternal antiviral treatment in the prevention of MTCT from an efficient public healthcare system in Hong Kong remains to be established. Neonatal HBIG prophylaxis on the day of birth (preferably administered within the first hour of birth), together with three doses of HBV vaccine given at age zero (on the day of birth and before hospital discharge), 1 and 6 months, is probably the most common regimen used in the offsprings of HBV carrier mothers to prevent MTCT. There are other regimens involving slightly different timing of the second and third doses (eg, given at ages 2 and 12 months) or an additional fourth dose. In the study of Papaevangelou, et al,23 infants completed vaccination on schedule and were HBsAg seronegative at the age of 9 months, with 97.2% having protective antibody titre. Nevertheless, immunoprophylaxis failure can still occur due to maternal high viral activity level. A study of 869 infants tested within 7–12 months found 3.1% (27) to be immunoprophylaxis failures, while the others were HBsAg seronegative. The failure rate was 0%, 3.2% (3/95), 6.7% (19/282), and 7.6% (5/66) when analysed according to maternal pre-delivery DNA levels stratified at <6, 6–6.99, 7–7.99, and ≥8 log10 copies/mL.27 Regression analysis indicated that maternal HBV DNA levels (OR, 1.88) and detectable HBV DNA in cord blood (OR, 39.67) were independent risk factors for failure. More studies to establish the factors associated with immunoprophylaxis failure are therefore warranted. Despite the large amount of literature published on the management of hepatitis B in pregnancy, there are many unanswered or partially answered questions. In many instances, in the decision for obstetric interventions, maternal hepatitis B status is simply ignored or assumed to be a minor or nonconsequential issue, and HBV infection as a potential risk factor of adverse obstetric outcome is often unappreciated. Furthermore, the medical approach to the control of HBV viral activity as a means of preventing MTCT has failed to address the various obstetric issues, complications, and scenarios that could complicate the administration of antiviral medications, with little in the way of cost-effectiveness and risk-benefit analysis. In view of the traditional successful passive-active immunisation in the prevention of MTCT, more rigorously controlled and well-designed studies are required to justify additional measures proposed in terms of enhancing maternal and infant wellbeing. Professor Terence Tzu-Hsi LAO is a Consultant Gynaecologist in the Department of Obstetrics and Gynaecology, Prince of Wales Hospital, Shatin, Hong Kong, PRC.